Designed so it can be attached to a wall or can stand alone on the floor. Holds seven fishing rods. Drop down drawer at bottom. Plan shows how to make your own fish drawer handles and fish decorations on top of project. All patterns drawn FULL SIZE. Measures 49"H x 26"W x 6"D. Order hardware separately or save with the Special Offer which includes the plan and hardware. 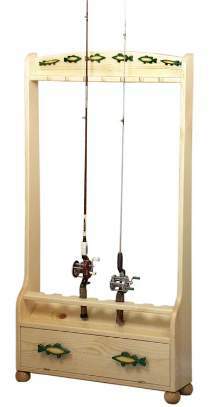 Fishing Rod Holder Hardware includes four roller balls, one magnetic catch and two pair of hinges. Project plan, wood, and wood finish are not included in the hardware package.